We constantly strive to reduce the steps required for you to get your job done. One of the reasons Windows Server 2012 is a such great release is that we spent so much time listening to our customers and understanding their scenarios and concerns. When development teams start from a technology/feature mindset, it can be hard to work across groups because helping another team usually means that you have to give up something you wanted to do. We were able to achieve a very high level of technology integration and cross-group cooperation because we all shared a common understanding of our customers and their scenarios. Teams were eager to help each other succeed in delivering those scenarios. When you have lots of teams working together towards a common goal, you can really change the game and tackle some really hard problems. Today’s blog is a good illustration of that. Anyone that has been involved in securing data or accessing data security knows that the traditional security models and mechanisms are not always flexible enough to address today’s concerns and scenarios. Whether it’s compliance requirements, increased business impact of disclosed data, or management of the sheer scale of data – it is clear that the capabilities provided by the current access control mechanism can be improved so that it is easier for administrators and users to address these challenges. A number of teams worked together to deliver Windows Server 2012’s Dynamic Access Control. I think you’ll find that it, like so many other things in Windows Server 2012, is just what you were asking for. If you haven’t downloaded the beta yet, take some time to read this blog and watch some of the videos it points to and then schedule some time on your calendar to download the beta and try it out. Nir Ben-Zvi, a Program Manager on the File Server team, wrote this blog. Hello, my name is Nir Ben-Zvi and I work in the Windows Server team. I’m very excited to introduce to you the new Dynamic Access Control feature set. I’ll start with a brief introduction and insight into the planning process, discuss the new Central Access Policy model and describe the end-to-end File Server solution that we built into Windows Server 2012. I will also touch on how we enable an incremental deployment model so that you do not need to move your entire environment to Windows Server 2012 in order to use the feature set. I will touch on work with partners in this area, too. You can find a Dynamic Access Control overview demo here. In today’s complex IT environments data is being created on distributed systems at a staggering rate and accessed through a plethora of devices. Compliance with regulatory standards and the need to secure leakage of business critical and personal data present major challenges for businesses and corporate IT. The key pillars for data compliance and leakage prevention are controlling who has access to information and having the ability to report who actually accessed specific information. We then looked at the different personas within an organization and how they participate in meeting the regulatory and business requirements for data compliance, in order to provide the right set of technologies and solutions that help address the data compliance challenge. 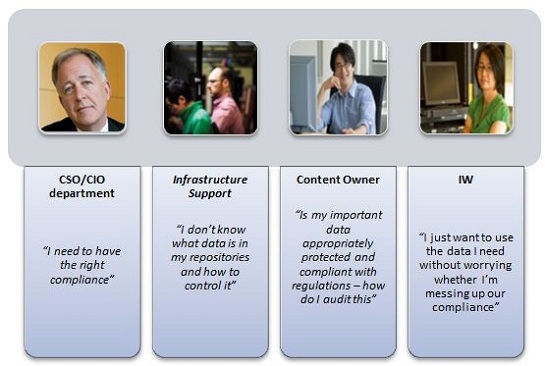 The range of personas involved starts with the CSO/CIO office that identifies the business and regulatory compliance needs. It continues with the IT administrators that manage the systems and the business owners that control the actual information. Last, the organization would like to keep the impact on the information worker to a minimum (ideally with no impact at all). These focus areas were then translated to a set of Windows capabilities that enable data compliance in partner and Windows-based solutions. Integrate Rights Management Services to automatically protect (encrypt) sensitive information on servers so that even when the information leaves the server, it is still protected. Compliance policy: This policy relates to compliance and business requirements and is targeted at protecting the right access to information that is being managed. For example: Allow only a specific group of people access to information that falls under the “US-EU Safe Harbor” regulation. Departmental authorization policy: Each department in an organization has some special data handling requirements that they would like to enforce. This is very common in distributed organization. For example: The finance department wants to limit all access to finance information only to the finance employees. Vendors should be able to access and edit only files that pertain to the project that they are working on. In financial institutions, information walls are important so that analysts do not access brokerage information and brokers do not access analysis information. Central Audit Policy is a powerful tool to help maintain the security of an enterprise. One of the key goals of security audits is regulatory compliance. Industry standards such as SOX, HIPPA, PCI, etc. require organizations to follow a strict set of rules related to information security and privacy. Security audits help establish the presence (or absence) of such policies and thereby prove compliance (or non-compliance) with these standards. Additionally, security audits help detect anomalous behavior, identify and mitigate gaps in security policy and deter irresponsible behavior by creating a trail of user activity that you can use for forensic analysis. Audit everyone who does not have a high security clearance and yet tries to access “high impact” information. Audit all vendors when they try to access documents related to projects that they are not working on. This helps regulate the volume of audit events and limit them to only the most relevant information/users so that you can monitor access to information across multiple servers without generating an unmanageable volume of audit events. In addition, the information tagging is recorded in the audit events so that event collection mechanism can provide contextual reports such as: Who accessed all the “high impact” information in the last three months. Identify data using automatic and manual classification of files. 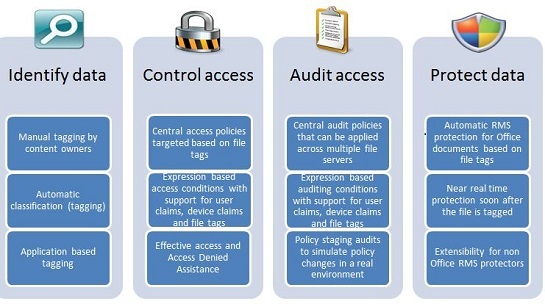 Control access to files across file servers by applying safety net Central Access Policies. For example, you can control who can access health information within the organization. Audit access to files on file servers by using Central Audit Policies for compliance reporting and forensic analysis. For example, you could identify who accessed highly sensitive information during the last three months. Encrypt data by automatically applying Rights Management Services (RMS) encryption for sensitive Microsoft Office documents. For example: you could configure RMS to encrypt all documents that contain Health Insurance Portability and Accountability Act (HIPAA) information. In order to support deployment across multiple file servers in the organization, we are also providing the Data Classification Toolkit that enables configuration and reporting across multiple servers. The current Beta for the Data Classification Toolkit is available for download here. One of the core design principles of Dynamic Access Control is incremental deployments. You can start using the feature set as soon as possible to solve targeted business problems for information access and audit. You can use most of the Dynamic Access Control capabilities with the Windows Server 2012 File Server and an upgraded Active Directory domain schema. Adding a minimal number of Windows Server 2012 domain controllers will enable user claims and so on. Each part of the system that you upgrade provides you with more capabilities but it is up to you to set the pace.